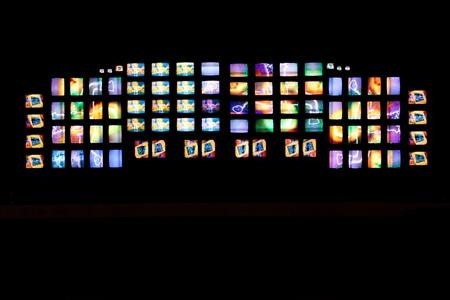 NAM JUNE PAIK M200/Video Wall, 1991, Television monitors, 118 1/16 x 377 15/16 x 19 5/8 in. 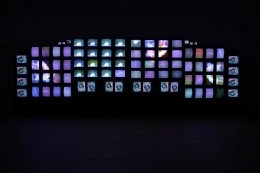 (300 x 960 x 50 cm) Cha Zoo Yong Photography Copyright POMA / fazi, inc.
James Cohan Gallery is pleased to present the multi-monitor, sculptural installation M200/Video Wall, (1991) by the visionary and peripatetic artist Nam June Paik, along with selected works from the early 1990s. The exhibition opens on February 12 and runs through March 14, 2015. The Korean-born artist died at age 73 in January 2006. 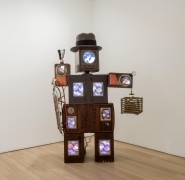 John Handhart, Paik scholar and curator of the Guggenheim Museum’s seminal exhibition The World of Nam June Paik in 2000 said, “Paik's prolific and complex career can be read as a process grounded in his early interests in composition and performance.” Paik trained as a classical pianist and studied composition at University of Tokyo. His undergraduate thesis on Arnold Schonberg ignited his interest in the avant-garde and prompted his move to Germany in 1956. Shortly after, Paik met Karlheinz Stockhausen and John Cage, and quickly became immersed in the electronic music scene. Cage encouraged Paik to come to New York, where the artist became a key participant in the Fluxus movement. During a visit to his family in Japan in 1962, Paik built his first robot from his cousin’s remote control toys (and his mother’s bra.) The name of the robot K456 refers to the Köchel catalog number of Mozart’s well-known piano concerto, thereby tracing a thread from classicism to the avant-garde. 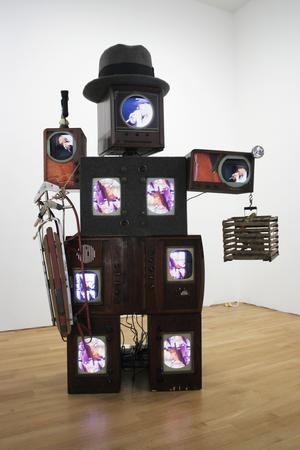 The 1990s saw the development of his robot portraits, created with old TV consoles, video footage and particular attributes to identify the subject. Beuys Voice, 1990, on view in Gallery 3, is a classic example of such a tribute, with the TV monitor head topped with Beuys’ iconic grey felt hat, scaled up to size. The sculpture commemorates their friendship, which started in 1961 and was based on their shared interest in shamanism and the avant-garde. Elements throughout the sculpture refer back to Beuys’ personal mythology based on the rescue of his downed plane and the elements of his survival; felt, rabbits that provided food and the sled brought by his rescuers. Also on view will be the ceiling mounted, multi-monitor Video Chandelier X, 1990, which speaks to Paik’s vision of a future lifestyle in the information age. The work comes from Paik’s often baroque sensibility that relates to his belief that “more is better”. Paik’s works are in the collection of a number of institutions, such as the Hirshhorn Museum and Sculpture Garden (Washington D.C.), Musée d'Art Moderne de la Ville de Paris, the Smithsonian American Art Museum (Washington D.C.), the Walker Art Center (Minneapolis, Minnesota), the Museum of Modern Art (New York), amongst others.